Most people are intimidated by Indian cooking thinking it is very complex and involves a lot of exotic ingredients. I know I used to think that. Sometimes that is the case, but other times you can make a really great and uncomplicated dish with a few simple ingredients. Another misconception about Indian food is that it always has a strong curry flavor. 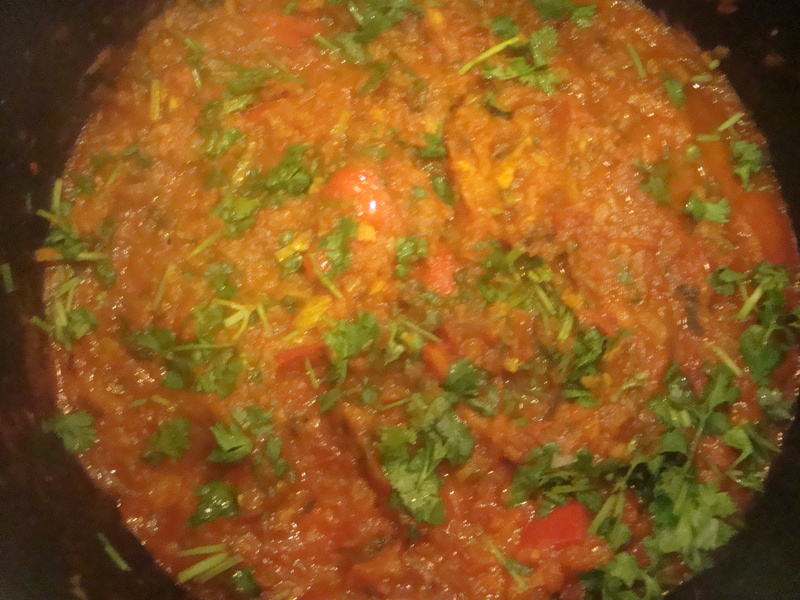 That is also not always the case as this recipe has no curry powder in it at all. This is just a delicious curry that is not difficult to make and is created with ingredients that you can find in any supermarket. This is my dad’s recipe and he has been making it for as long as I can remember. I have been making it for a few years and I admit that mine never comes out as good as his. Like my chicken soup, it uses both the stems and the leaves of cilantro which is something that he does often. For my dad, this dish is a labor of love and he takes a lot of time with each step – softening the onions for 30 minutes, cooking the sauce for another 30 minutes, stirring every 5 minutes, etc. In my version I shave some cooking time off each step of his original recipe in order to make it less labor intensive and accessible. If you have the time to cook each step longer, then by all means go ahead! It will only make the dish better. Even if you follow my cooking times you will not be disappointed with an exotic and impressive curry. 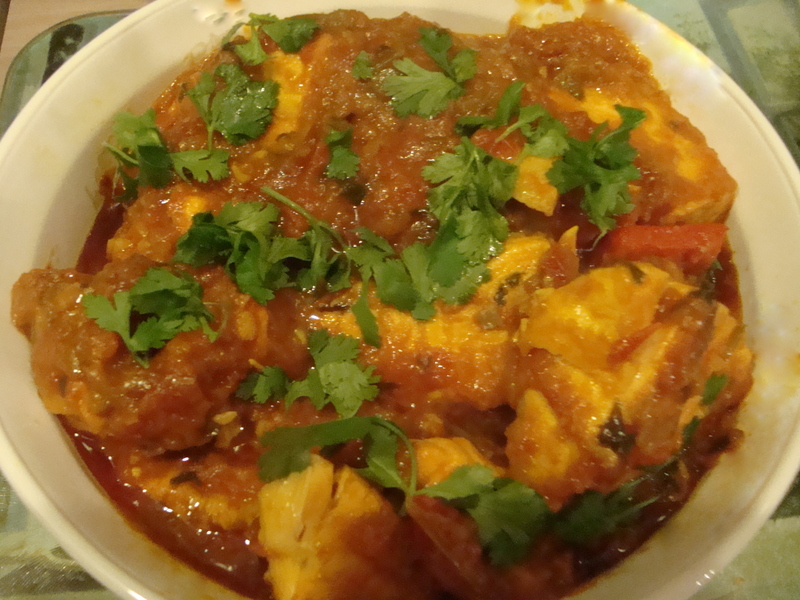 We often eat this curry as a fish course for a Shabbat dinner, or as a main course on any night. Kosher salt and freshly cracked pepper. In a food processor or mini chopper pulse together the onion and garlic. If you do not have a processor you can chop everything by hand. Just be sure it is finely chopped. In a large pot heat the canola oil over medium heat. 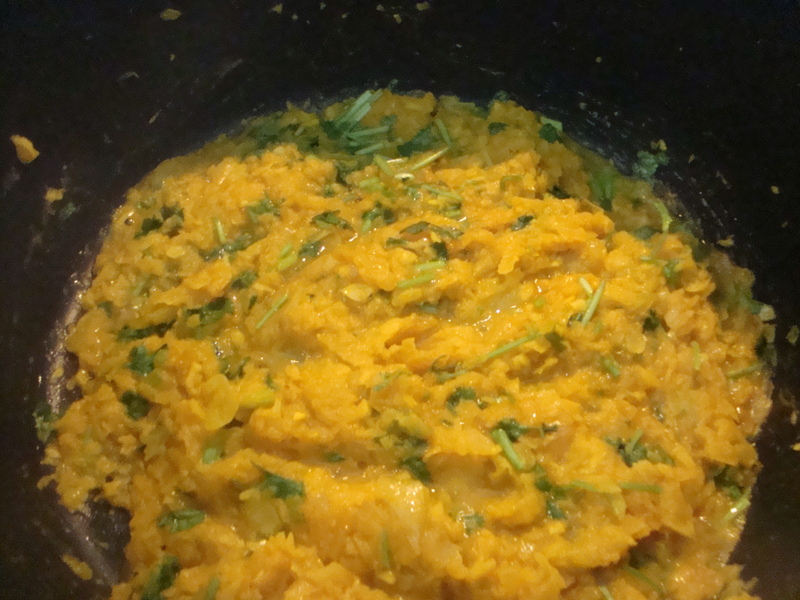 Add the onions, garlic, cilantro stems, turmeric, salt and pepper and mix well. Cook over low heat until the onions completely soften, about 15 – 20 minutes stirring often. If the mixture begins to stick add some water and keep stirring. You want the onions and cilantro stems completely melted. Add the red pepper and tomatoes with their juice. Break up the tomatoes and mix well. 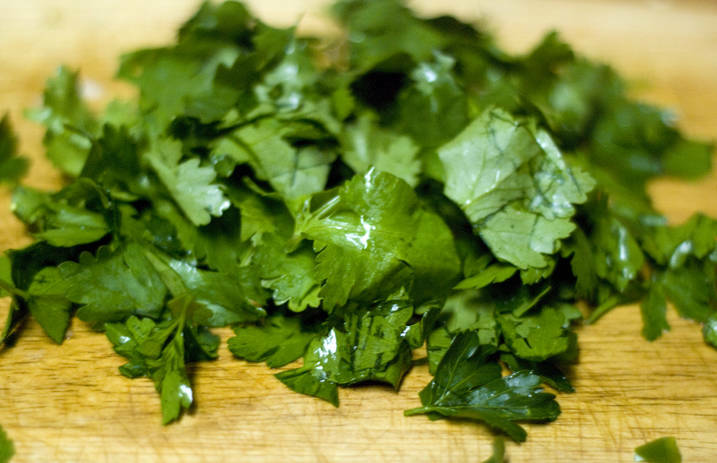 Add the cilantro leaves, a few pinches of salt and the juice of a lemon. Continue to cook over medium heat for about 15 minutes until you have a thickened sauce. Add the salmon pieces and stir once to combine. 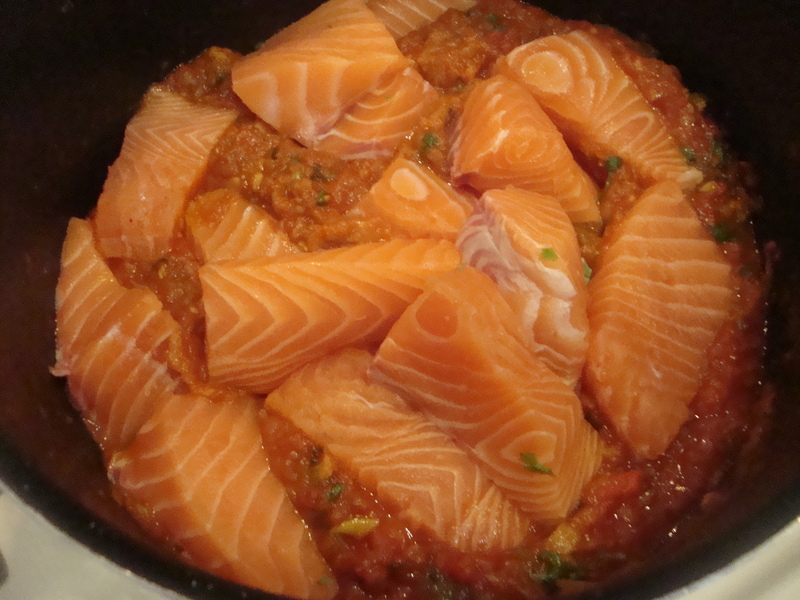 This is the last time you should actually stir the curry to avoid breaking up the salmon once it begins cooking. You will only want to shake your pot after this. Reduce heat to low and cook the salmon for 15 minutes covered, shaking the pot gently back and forth a few times. 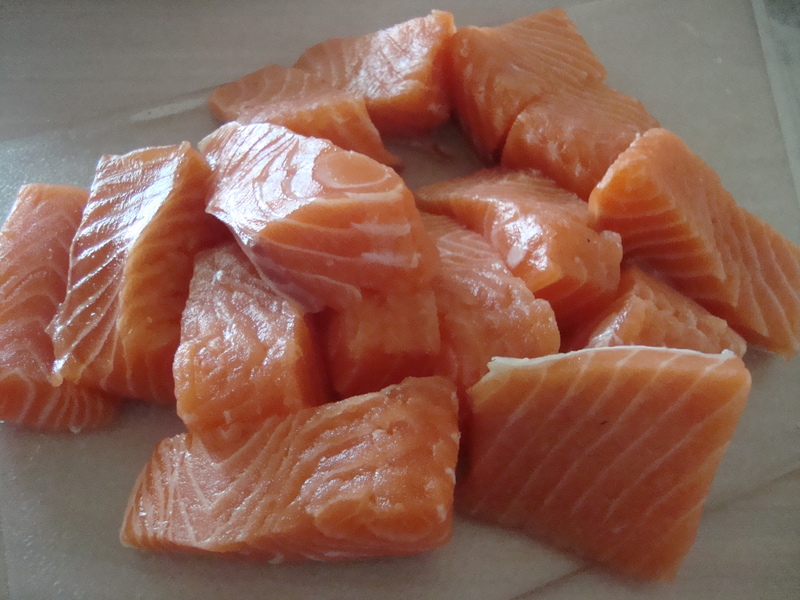 Carefully remove salmon pieces from the pot. Garnish with cilantro and serve with plenty of sauce over rice. This is one of my favorite dishes that your dad makes. Now I can make it at home, I am so excited. Yay! I hope you make it! It is soooo good! Hi Lois. I like the chunks because that way you get more sauce with each piece of salmon. If you do not want to cut up the fish you can do one big piece of fish, but will need to adjust cooking time. Just be sure to serve plenty of sauce over the salmon. Let me know how it comes out! Thanks Micky. Can a do chicken that way also? Yes! You can do chicken like this also. Just adjust the cooking time to be sure the chicken is cooked through. It is great with chicken. I prefer my salmon curry when you make it for me! This recipe is delicious enough to tempt me to eat fish again. I made this for Shabbat and it was great! We ate it Friday night and Saturday! I’ll definitely make it again. I was a bit intimidated to make it but it was a lot easier than I thought! Thank you for this. I was only cooking for me and my sister so I used three shallots instead of onions and I didn’t have turmeric but used a little madras curry powder instead which contained it. The results were amazing, very tasty indeed. I will definitely try it again.